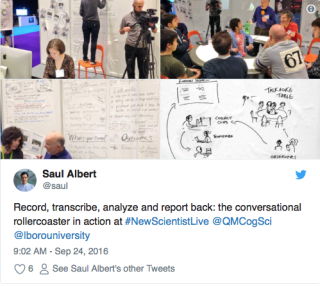 I was part of New Scientist Live (NSL), where myself and other researchers designed an innovative way of involving patients and the public in the live science of conversation. We aimed to engage the public in conversation analysis. ‘The Conversational Rollercoaster’ which was a ground-breaking way of both communicating our results to the public; getting feedback on ongoing work; and uniquely, involving the public in doing analysis and finding results which we then analysed; publicised; and published. 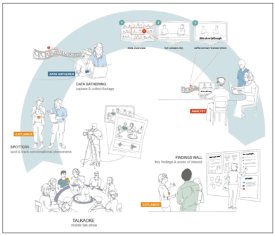 I was part of a wonderful team, where I played a key role in designing and delivering the conversational rollercoaster with the public, and was second author on our resulting paper. The Conversational Rollercoaster had 3 parts. Firstly, a large public engagement exhibit at NSL, secondly parallel online engagement activities; and finally, further work where we worked with members of the public to analyse and published the results they found during the engagement exhibit. 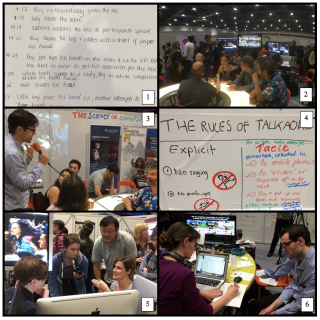 We ran a ‘ChatLab’ at NSL. This firstly involved a ‘Talkaoke’ table (Number 2, Figure 3), which was a live chat-show. A host with a microphone sat in the middle of a round table and members of the public were encouraged to sit and talk. Hosts and members of the public changed, but the conversation carried on flowing with new arrivals and topics organically evolving. The aim was to have a continuous conversation for 6 hours each day of NSL. We did it. Any member of the public who attended NSL who wanted to participate could, and ages 3-80 all joined in. But this was not the only aim. The Talkaoke table was part of a wider ‘ChatLab’ (Figure 1). A live video feed filmed the table and showed the events on a big screen (Figure 2). It was hooked up to 4 computers each one a different analysis-station: transcription; collection making; video editing; and photograph generation. Members of the public who watched the Talkaoke were approached by one of the four of us–conversation analysts. We chatted about our own work, sought feedback on ideas, and explained how conversation analysis works (Figure 6). I was the only analyst who studies clinical communication, and I spoke with many people about what makes a ‘good’ conversation with their GP, which was helpful to support my current PhD work. A key aspect was the public led their own involvement, and each interaction was individually deigned and tailored. If someone was interested in what we did, we would show them HOW to do it. To support the public to analyse talk, we would take something easy such as ‘How does someone behave when they want to leave the Talkaoke?’ and ask member of the public to observe and describe this. An example of a written observation is shown in Figure 3, number 1. This was then their hypothesis for how ‘leaving’ works in conversation. 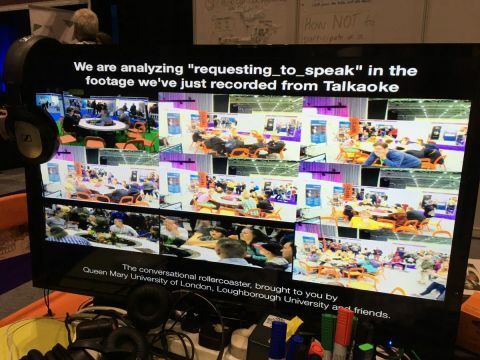 If people were interested we’d take them to the analysis-stations and support them to use data from the Talkaoke live-feed to confirm or disconfirm their hypothesis (Figure 4 and Figure 5). We wanted to provide all members of the public with tangible evidence of their involvement, and a resource for further information. At a real roller-coaster you can purchase a photo of yourself screaming at a particularly thrilling point in the ride. We reflected this in our take-home materials, providing everyone with a photo of themselves on the conversational rollercoaster, with a waveform underneath showing their converstaion (Figure 7). Live tweets of the day using public-targeted hashtags (Figure 8). A widely accessible online live stream of the ChatLab. Youtube videos of the first day (available here and here). A series of blogs, aimed at members of the public, Interactional analysts and primary care researchers. We uniquely engaged the public to do what we do everyday. Analyse talk. And they were really good at it. We reflected on how we developed an event that engaged the public on multiple levels and co-authored a paper on this. This paper examined how we engaged the public(s) in the science of talk and includes a phenomenon identified by members of the public (Figure 9). We published open access and used public-targeted hashtags to publicise this. Our next step is to publish a second paper, with the members of the public who identified this phenomena as co-authors, analysing in detail what they found. 1. 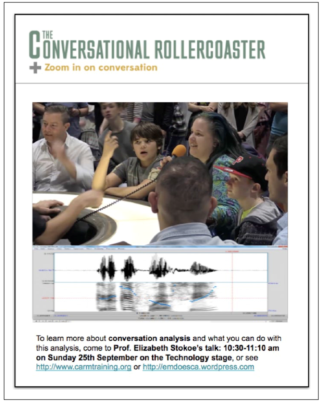 Albert S, Albury CVA, Alexander M, Harris MT, Hofstetter E, Holmes EJB, Stokoe E: The conversational rollercoaster: Conversation analysis and the public science of talk. Discourse Studies 2018, 20(3):397-424. 2. Laurier E: Some thoughts on the Conversational Rollercoaster. Discourse Studies 2018, 20(3):438-442. 3. Antaki C: Conversation Analysis at the fair. Discourse Studies 2018, 20(3):425-430. 4. Housley W: Conversation analysis, publics, practitioners and citizen social science. Discourse Studies 2018, 20(3):431-437. Figure 9 A phenomena identified by members of the public.